Halis Tabaković works as Head of Microsoft department at FMC d.o.o. He is a Microsoft certified trainer and professional. 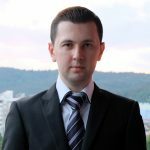 He has 10 years of experience in IT and takes pleasure in working on automation tasks with PowerShell and other Microsoft tehnologies. His areas of expertise include Data security, Cloud solutions, Domain services, Virtualization and more. He is also a frequent speaker at IT conferences. This blog is for his thoughts and reflections on Microsoft products & services, IT in general and anything else that he’s currently intrigued by.